Lien Yeung graduated from UBC Journalism in 2015. She is currently a reporter and anchor with CBC News and also the host and producer of CBC Vancouver News on Saturdays and Sundays. Her coverage of the 2017 B.C. wildfires earned her an award from the Radio Television Digital News Association (RTDNA) and Jack Webster award nominations. 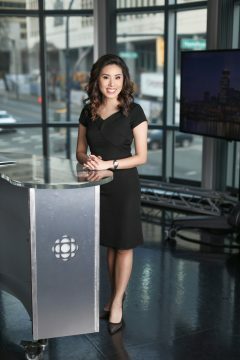 Directly after graduating from UBC, Yeung was a recipient of CBC’s prestigious Joan Donaldson news scholarship. What led you to UBC Journalism? I worked quite a few years in communications, marketing and PR before I decided to make the switch into journalism. I had always been interested in media, journalism and storytelling. I’d always worked with media agencies, like Telus, and eventually I was with Rogers. I ended up at CBC. I started off as a communications officer. I was there for a couple of years. I was promoted, and it was going really well. I had the chance to work quite closely with our journalists and just in watching the work they did I realized I’d really like to be on that side of the table, to be the person actually helping to shape the stories as opposed to being on the receiving end of things. How did you find the transition into journalism? I was fortunate in the sense that I felt like I had really good mentors at CBC. Initially I knew I was interested, but maybe because I was young, I didn’t really have the confidence to say, “This is what I want to do and I can do it.” Fortunately I had people encouraging me and pushing me and giving me opportunities. I was already doing stuff on air in various capacities, like a column on The Early Edition. I was kind of like their community liaison person and I hosted a couple of feature documentaries. So I had people around me who were willing to take a chance on me. The newsroom can be a tough nut to crack so I went to journalism school to learn the core skills, gain some experience and build my credibility. I quit my full time job at CBC and fortunately just as I was starting j-school there was a weather presenter position open. It was to do weekend weather, so I was working two days a week doing weather and going to school full time. That’s how things started for me. What was a highlight of your time at UBC Journalism? The biggest highlight is really you get the chance to sit back and think about the journalism side of things — what it means, why it’s important, how you can be better, how your stories can be bigger and how you can impact more people. I think when you’re in the newsroom in the day to day grind, you don’t get that opportunity. I mean you do, but you don’t have two years to actually really think about it. And for me there was a practical aspect — I needed it to transition into journalism. I needed it for some of those raw skills, but at the same time it’s a pleasure to be able to go back to school and take time to develop who you are as a person and who you are as a journalist. What are some of the skills you still draw from? At CBC we’re all multimedia, so as a reporter you’re expected to file for radio, television and for web. There are different skills required for all of those things. I was really fortunate — when I was in school we had Dave Rummel who’s one of the best documentarians out there. He’s an outstanding storyteller. So he was our guide and I had an entire semester just dedicated to video storytelling. You get to do things that are a little more in-depth and put together a piece from beginning to end. You cut it, you do all of those pieces, and that’s something you don’t really do much in the newsroom. On the web side of things, even just the idea of how you write a web article or a newspaper article. It’s a very specific process that’s been widely accepted and that’s expected of you. You don’t really get a better teacher than Frances Bula. What was the biggest challenge while you were at UBC? I think just managing timelines and deadlines, which is such a core part of what we do as journalists. I had so much going on, it’s probably the busiest I’ve ever been in my life. I was in school full time, I was still working 16 to 20 hours a week, and in addition to that, I was also the president of SFU’s alumni association. So that was really stressful, but it was great because I got through it and it teaches you a lot about resiliency and tenacity. I also think one of the projects I found the most interesting was the beat assignments. We were given a beat and expected to cover it over a couple of months. It’s like real life, figuring out how do you as a journalist get transplanted it into a community that may not necessarily be yours? And how do you find stories? You’re dropped in and it’s sink or swim. I think the beauty of UBC is that it gives you the long view, and I liked that it gives a more holistic view of journalism. It’s not just looking at journalism from a day to day perspective. There is some of that, obviously, because you need it in order to be a working journalist and try to get a job. But I think UBC really gives you perspective on what journalism can be in its biggest, most fruitful way. I also wish I had taken the International Reporting Program course. I was just so overloaded at the time. I think those opportunities are really rare and I think if you have a chance I would take IRP.